Product safety is the focal point during the filling of pharmaceutical products. Sterility test isolators are used to inspect cleanliness and sterility of filled batches and to increase safety. Metall+Plastic offers an appropriate solution with the new sterility test isolator (STISO). The STISO was designed as a plug&play isolator for aseptic (STISO), and toxic (STISOtox) applications. It has a variety of new features and was one of the highlights of the Achema 2018. The sterility test isolators from Metall+Plastic are easy to adjust to customer requirements due to their modular design. The standard version includes four glove ports in the isolator chamber. Isolator chambers with two or three glove ports are also available. The MTC (Material Transfer Chamber) can be installed to the left or the right of the chamber or on both sides. The MTC can also be retrofitted later. It comes in two different sizes in the standard version. The STISO can be operated from one side and therefore, is suitable for space saving installation against the wall, allowing the STISO to be used for small batches. To minimise physical stress for the operators, the designers for the STISO placed an emphasis on its ergonomic design. An ergonomic study was performed in cooperation with the company Scala Design and the results of the study were incorporated into the design of the sterility test isolator. Therefore, the operator panel is at an optimal height, it is pivotable and angle adjustable. In addition, the machine allows for sufficient legroom. The insertion heights can be adjusted to match the operator’s height. It is also possible to work in a sitting position with an ergonomically designed pivoting chair. Operators also benefit from the loading cart and trolley. Additional options are: particle monitoring, air sampler, sterility test pumps and scales. Highly active agents like Cytotoxic for live vaccines, viruses and bacteria are becoming more and more vital. It is critical to guarantee the operator’s and the product’s safety while processing toxic substances. This is accommodated by utilising HPT filters from Metall+Plastic. The filters separate the airborne particles from the product. The HPT filters are able to handle a volume flow of approximately 1300 cubic meters per hour in H13 or optional in H14 quality. The filters are lightweight and easy to change. They also offer the opportunity to perform an integrated filter integrity test and the plastic paneling can be burned without any residue. 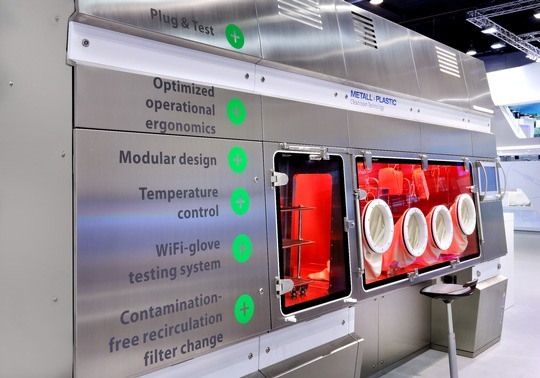 The requirements of the user were also considered during the design of the glove testing units; they are integrated on the side of the panel to make the operation easy. Inspection covers are integrated on the side of the system, are ready-for-use in a short amount of time and stowed-away fast. The software for the testing unit is integrated into the HMI. Another benefit for the operator, besides the ergonomic design of the STISTO, is the shortened cycle times that are the result of catalytic ventilation. This ventilation ensures that the H2O2 used for the isolator decontamination is removed quickly. The evaporation system RGx enriches the pre-conditioned carrier air with H2O2 and blows it into the STISO. Due to the catalytic ventilation, the Metall+Plastic system obtains time-savings of several hours, depending on the expected remaining H2O2 concentration. This is achieved by a constant air circulation with a catalytic converter that absorbs H2O2 and removes it continuously during the operation. The STISO creates a maintenance friendly so-called flash evaporation. With the patented DECOjet process from Metall+Plastic, the liquid H2O2 will be transformed into a gaseous state. The advantage: hardly any maintenance work is needed in the evaporator area. Still no residues were determined within half a year during the recommended maintenance interval.